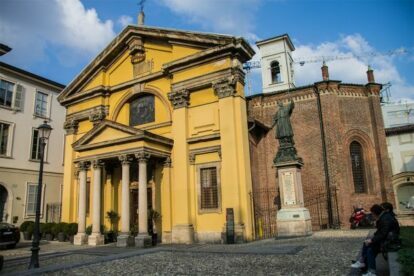 Every time I read an article about one of the many churches in Milan I wonder how each of them is always proclaimed as the oldest in the city. On the sides of Santa Maria Podone is some evidence in the form of written words dating to 871. What is visible today, however, is the result of numerous restorations and improvements, some made by the Borromeo family, one of the most powerful families of those years. The bell for example is not in its original position, which is deductible from the visible signs in the right aisle. The statue in bronze and copper on the right of the church represents Saint Charles Borromeo and was created by Ambrogio Grosso and Alberto Guerra. It was originally located in Piazzale Cordusio and its presence in this square is characterized by a very curious story, written in Latin and in a very “politically correct” way on an inclusion which is located on the pedestal of white marble. It seems, however, that the real reason for the location change is related to a problem of “traffic”: the Austrian governor in Milan demanded it be moved “within 10 days” for “obstructing traffic” after his carriage bumped into it.